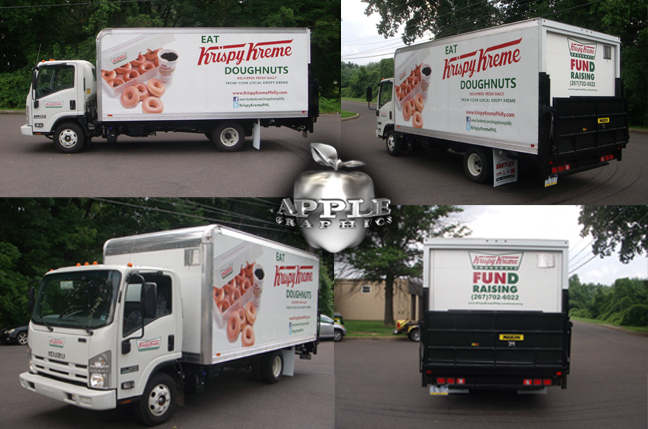 Our Latest: Krispy Kreme Doughnut Truck! Our Latest Truck Wrap. This is a Die-Cut vinyl application. The lettering & high quality image of the doughnuts & coffee are vinyl prints that were cut out and placed. This is a great example of how to be cost efficient and still have a very visually effective vehicle wrap. The Truck is white, therefore it was used as a background instead of having full graphics covering every square inch. The letters are die-cut and properly placed (this process is explained more in depth in the previous blog) and yet again, another successful truck wrap. Take a look in our gallery for many other ways you can wrap a truck! Have a wonderful day!